The Kipper Kids were a duo composed of Martin Rochus Sebastian von Haselberg (born 20 January 1949) and Brian Routh (9 March 1948 – 3 August 2018), two artists known for the extreme, raucous and often funny performance art they made together in the 1970s and after. Von Haselberg lives and works in New York, US; and Routh lived in Leicester, England, at the time of his death from cancer. From 1971, the duo were also known as Harry and Harry Kipper. Martin von Haselberg and Brian Routh met in 1970 at East 15 Acting School. After months of improvisation they invented a character they called Harry Kipper and began experimenting with different theatrical formats to use him in. Upon being expelled for being "too experimental" they took to the road, touring constantly. When von Haselberg and Routh coined the name Kipper Kids, they were originally called Harry and Alf Kipper and had two distinctly different characters. Because von Haselberg and Routh could never remember who was Harry and who was Alf, they dropped the name Alf and decided to call each other Harry. At the same time they decided to make their characters identical. Thus the Kipper Kids as Harry Kipper and Harry Kipper were born in 1971. From 1971 to 1975, most of their performances took place in Europe. In 1974, David Ross, later director of the Whitney Museum of Art and the San Francisco Museum of Modern Art, saw them in performance at Gallerie Rudolf Zwirner in Cologne and invited them to do some shows in California. The Kipper Kids moved to Los Angeles in 1975. Despite having studiously avoided being part of a movement, they found themselves associated with the early years of punk in Los Angeles. In 1982, they stopped actively collaborating, performing as The Kipper Kids only occasionally until their final performance together at the National Review of Live Art, Glasgow in 2003. 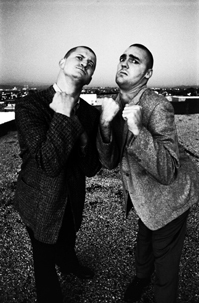 Quoting from an announcement for the Berkeley Art Museum: "Through actions that at times stress the visual, and the violent aspects of social rituals, the British Team of Harry and Harry Kipper perform in a fashion that combines the zany theatrics of Spike Milligan with a scatological slapstick that is all their own". Routh and von Haselberg created elaborate but purposely low-tech installations in which they would perform "ceremonies" using mostly found objects. Examples are "Tea Ceremony" (1972) a Japanese tea ceremony-inspired piece and "Boxing Ceremony" (1972) in which one performer beats himself until bloodied whilst the other acts as referee. Japanese rituals, English music hall, Viennese Actionism, and the work of Samuel Beckett were amongst their influences. The Kipper Kids made two projects for television. For HBO they produced Mum's Magic Mulch, and for Cinemax, K.O. Kippers, while the Kids also appeared in a 1982 project for HBO executive produced by von Haselberg, The Mondo Beyondo Show, a one-off variety show of sorts for performance artists (including a pre-Stomp Yes/No People, La La La Human Steps, Bill Irwin, Paul Zaloom and others) hosted by Bette Midler's Mondo Beyondo character. Von Haselberg made a number of films at American Film Institute with Routh in the lead role: Quiet Lives (1991), People Are No Damn Good (1991) and Your Turn To Roll It #54 (1992). They also were seen as characters in the 1980 film Forbidden Zone and the 1989 film UHF. Another television appearance came during the fifth season of ABC's Moonlighting. First aired on Valentine's Day, 1989, "I See England, I See France, I See Maddie's Netherworld" featured The Kipper Kids as a pair of gravediggers in a surreal dream sequence, along with leading cast members Cybill Shepherd and Bruce Willis. The Kipper Kids also performed a song in the 1991 comedy film The Addams Family — "Playmates" which can be heard in the film and on its soundtrack. They also starred in the 1990 comedy film The Spirit of '76. Currently, Martin von Haselberg has created a series of large photographic images made into inflatable sculptural shapes titled 'Floatulents', and is a painter. In the decade before his death, Brian Routh created soundworks that incorporated vocal soundbites of world leaders, politicians, madmen, poets, murderers and others. Von Haselberg has been married to Bette Midler since 1984. They have one daughter together, actress Sophie von Haselberg. Routh was married three times: to net.art pioneer Nina Sobell from 1975 to 1981, to performance artist Karen Finley from 1981 to 1987, and to digital artist Patricia Wells from 2012 until his death in 2018. ^ a b c d e f On Edge: Performance at the End of the Twentieth Century; Carr, C.
^ a b c d California Video: Artists and Histories; Los Angeles The Getty Research Institute, The J. Paul Getty Museum, edited by Glenn Phillips. Video works of Brian Routh. This page was last edited on 15 April 2019, at 15:52 (UTC).